The Dinner by Herman Koch. Hogarth, 2013. 292 pages. Ebook. This is a hard book for me to review, mainly because although it was clever and unique, it was also disappointing and hard to get through. The entire story consists of a single dinner between Paul, our narrator, his wife, Claire, and his brother and sister-in-law, Serge and Babette. The dinner appears to be an innocent gathering at the outset, but as flashbacks and side-tracks into the lives and character of the brothers and their families are slowly revealed, we learn that there is a bigger, more important issue at hand with this dinner concerning a problem with their sons. Paul is an interesting narrator: the first few chapters of the story portrayed a decently likable guy, and I felt like I was on his side, but as the story progressed, he became unreliable and a bit of a dodgy character. His character was certainly complex, but I can't say I found anything dynamic about him. I got the sense that he had no true moral compass, despite pretending like he did. In fact, I don't think anyone in this book truly had a moral compass. The actual act that their sons did (intentional vagueness so I don't give anything away) that prompted this entire dinner is pretty shocking, but it was never mentioned as being wrong, only in terms of how to cover it up. This bothered me, largely because it just didn't feel real. Who are these people and why are they so cold? There was almost no empathy or compassion to be found anywhere, which I understand is how some people are, but the falseness and despicable nature of these people was just overwhelming. As I've mentioned before, I'm completely fine with hating every character in a book as long as the book can hold up to it, but I'm not sure if The Dinner was able to do that. To be completely honest, I preferred the small inserts of the actual dinner and the interactions with the waiter, which felt like comic relief - albeit comic relief smothered in pretentiousness. 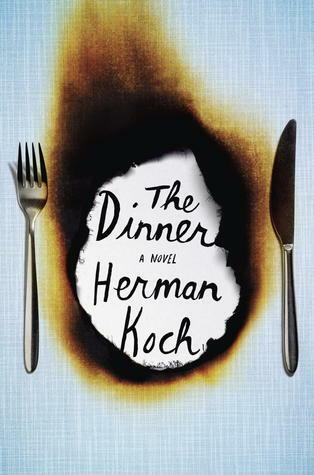 On a more positive note, Koch delves into some deep topics throughout The Dinner, such as mental illness and the notion of what truly constitutes a happy family, and in this area he brings up some compelling points to ponder. A major theme that seemed to consistently pop up was that appearances are deceiving, which can be interpreted in so many ways. There is also an overarching atmosphere of darkness and evil that permeates each page, which is one area in which Koch truly excelled - the man knows how to develop atmosphere. By the time I put this book down, I felt slightly nauseous from what I digested (intended metaphor), and I'm not sure it is something I wouldn't particularly recommend based on how much I enjoyed (or didn't enjoy) it . I would recommend for its psychological interests and unique storytelling idea, but that's likely it. For this reason, I am giving The Dinner two-and-a-half stars.